Mr. Rutter went on to study at Clare College, Cambridge, where he became director of music during the 1970s, and he has been happy to oblige whenever Clare’s respected choir needed something new to sing. But it was as an undergraduate in the 1960s that the course of his life was fixed. He was conducting a Christmastime concert with some of his music on the bill, including a relentlessly cheerful number, the now-famous “Shepherd’s Pipe Carol,” that he wrote when he was 18. Days later, David Willcocks, who directed the chapel choir of King’s College nearby, requested the manuscript. Mr. Willcocks was the most important figure in English choral music at the time, and, liking what he saw, he made some calls on Mr. Rutter’s behalf. Before Mr. Rutter’s student days were up, the carol was published and recorded by EMI. Mr. Willocks also invited Mr. Rutter to join him as co-editor of the hugely influential “Carols for Choirs” anthologies that still largely determine what is sung at this time of year in churches worldwide. At the same time, Mr. Rutter was expanding his horizons, working as a contract composer (he helped William Walton revise his opera “Troilus and Cressida”) and ramping up the scale of his own writing. He also set up his own choir, the Cambridge Singers, who for more than 30 years have been recording Mr. Rutter’s output for his own CD label, Collegium Records. He’s a one-man industry, and though he comes across as kind, genial and scholarly, his success is underpinned by a smart sense of business. Not everybody likes his work, which tends toward a tuneful, easy-listening accessibility that robs him of a place in the pantheon of serious composers. When I mentioned his name to the modernist composer and conductor Pierre Boulez in an interview several years ago, the response was nothing but a snort. But perhaps that’s a natural hazard of composing choral music. 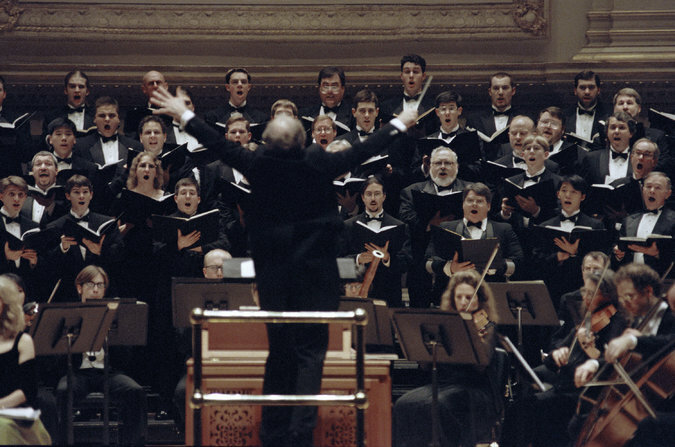 John Rutter conducting the AOL Chorus at Carnegie Hall in 1997. Another common criticism of Mr. Rutter’s work is that it is derivative, declaring without shame its sources — mostly Britten, Walton, Fauré, but with a touch of Broadway. What few can deny is that, at its best — in classics like “What Sweeter Music,” which thousands of choirs will sing this holiday season — his writing is immaculately crafted, with a gift for melody that most composers would kill for. And his music touches people’s lives in ways that most contemporary classical music never will.